Your wedding is the most special day of your life and that’s why your first priority is always to make it as happening and enjoyable as possible. One of the great ways to add colors to your wedding day is by choosing good entertainment. Although the options are plenty, we will suggest you go for dueling pianos. Do you wonder why? Well, read this post to find it out. One of the best things about dueling pianos is that, unlike DJs or hired musicians, they needn’t require a list of songs in advance which they would need to play on your wedding day. This means that the performers are willing to play any song of your choice at the moment. So, whatever you are feeling at the moment, whether happy, romantic, or excited, you can ask the dueling pianos performers to play the song that matches your mood and enjoy! Since dueling piano performers can play any song right away, you needn’t have to spend hours to prepare a list of songs beforehand. Wedding preparation is full of hustle and bustle, having you to do innumerable tasks. By hiring dueling piano performers, at least, you would save yourself the trouble of preparing all the songs that need to be played on your wedding day. You, along with your guests, can suggest the songs you want to listen to during the ceremony. Dueling piano performers are energetic and lively. They can interact with the audience in ways which other entertainers surely can’t. The performers would provide awesome background music and engage with the guests in such a way that all the guests would love to dance on your wedding day. They also know how to create the right mood of the audience so that they feel relaxed while dancing their hearts out. Mark our words – you wouldn’t come across a single guest who’ll be hesitant to bust a groove. Many of the dueling piano performers not only provide awesome music but are also known for light-hearted roasts, comedy skits, and knee-slapping banters. 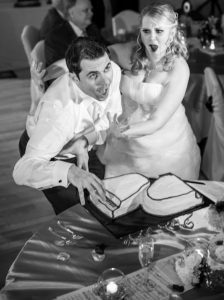 If you want your wedding day to be also a laugh therapy for your guests than dueling piano can be a great option. The performers will provide both kind of entertainments – music and comedy. So, hiring dueling piano as entertainment will prove to be quite a two-in-one kind of a deal for you. If you are looking for dueling piano performers for your wedding entertainment, you can book Premier Piano Shows. The brilliant performers will surely make your big day absolutely memorable! Dueling Pianos: Central Florida covered throughout August! Why Does Your Corporate Event Need Dueling Pianos?